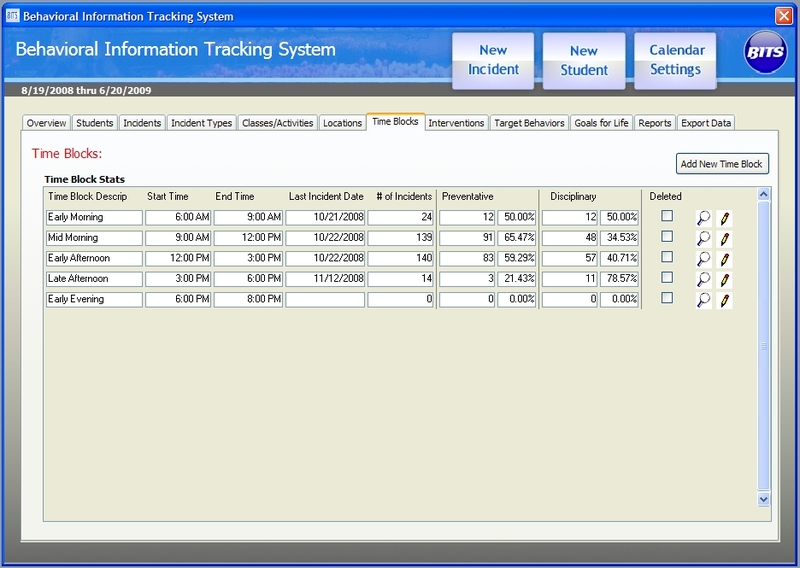 The BITS Behavioral Management System allows you to track student behavior by time of day. Time of day does not always relate to class or activity because in some situations students can have the same class at different times. This is the name that you give to a particular block of time. This can be as general or specific as you need - for instance mid-morning or arrival. This is the starting time for the Time Block. This is the ending time for the Time Block. This is the date of the last recorded incident for this block of time. 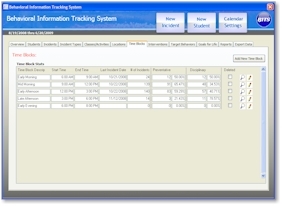 You can create new behavioral incidents in the Incidents Tab or by clicking on the "Create New Incident" button at the top of the program screen. The Preventative column summarizes the count and percent of total incidents that are considered Preventative. The higher the percentage of Preventative behavioral incidents, the more in control students are likely to be during the specified time. The Disciplinary column summarizes the count and percent of total incidents that are considered Disciplinary. The higher the percent of incidents are Disciplinary the more likely it is that the block of time is prone to disciplinary behavioral incidents. A high reading in this column may indicate that the time frame could use additional resources, or that certain students need to be seperated during this part of the day.